Can’t wait to see the movie Julie and Julia this Friday, as I am a big fan of Julia Child—and I always love watching Meryl Streep too. Thought I’d dedicate this piece in honor of an extraordinary woman who helped change the food movement in America. Julia’s advice for eating healthfully was to have, “small helpings, lot’s of variety, no seconds, and no snacking”. Here is my favorite, healthy vegan recipe by her. This classic French casserole is now associated with a cartoon rat, but the dish—a delicious stew of eggplant, onions, tomatoes, bell peppers, and zucchini—inspires you to try your hand at cooking. Bon Appétit! 1. Peel eggplant; cut lengthwise into 1/4-inch-thick slices, then cut into 3-inch-long, 1-inch-wide strips. Cut zucchini into same size strips. Place vegetables in large bowl; sprinkle with 1 tsp. salt. Let stand 30 minutes. Drain; dry with paper towels. 2. Heat 4 T oil in large skillet over medium-high heat. Working in batches, add eggplant and zucchini to skillet; sauté until light golden, about 1 minute per side. Transfer to plate; reserve. 3. Add 3 T oil to skillet; heat over medium heat. Add onion and peppers; sauté until just tender, 10 to 12 minutes. Stir in garlic. Season with salt and fresh ground pepper. 4. Place tomato strips atop onion-pepper mixture in skillet. Sprinkle with salt and pepper. Cover skillet; cook over low heat until tomatoes begin to juice, about 5 minutes. Uncover; baste vegetables in skillet with juices. Boil until juices are almost evaporated, 2 to 3 minutes. 5. Transfer 1/3 of onion-pepper-tomato mixture to 2 1/2-quart pot; sprinkle with 1 T parsley. Top with half of eggplant and half of zucchini then, remaining onion-pepper-tomato mixture; sprinkle with 1 T parsley. Layer remaining eggplant and zucchini over; sprinkle with 1 T parsley. 6. Cover; simmer over low heat 10 minutes. Uncover; tilt pot and baste with accumulated juices. Increase heat to medium; simmer uncovered, basting several times with pan juices until only 2 to 3 T juices remain in pot, watching closely to avoid scorching, 10 to 15 minutes longer. Season with salt and pepper. Yields 8 servings. Serving size: 1 cup. Nutritional content: 152 Calories, 12.05g fat, 1.75g protein, 11.15g carbohydrates, 3.17g fiber, 440g sodium. *Can be made 8 hours ahead of time. Cool slightly, cover then, chill. Serve at room temperature or rewarm over medium-low heat before serving. 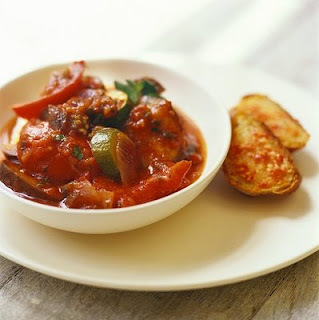 mmmmm simply delicious, when i saw that recipe in the ''Ratatouille'' movie, i run to my kitchen and began to make my own one! now me and my husband use less viagra online and do more kitchen!